Julian Sitkovetsky (Yulian Sitkovetsky) was a Russian (Ukrainian) violinist born (in Kiev) on November 7, 1925 (Heifetz was 24 years old and already living in the U.S. Leonid Kogan was a one-year-old child.) He is remembered mostly for having lived a very short life and for being the father of Dmitry Sitkovetsky, violinist and conductor, and the husband of pianist Bella Davidovich. He was a prodigy, starting violin lessons at age 4 with his father, then continuing with David Bertie at the Central School in Kiev (Ukraine.) At age nine, he played the Mendelssohn concerto with the Kiev Symphony. In 1939, at age 14, he enrolled in the class of Abram Yampolsky (teacher of Leonid Kogan and a well-known Russian pedagogue, though not as celebrated as Eduard Grach, Zakhar Bron, Leopold Auer, or Peter Stolyarsky) at the Moscow Central Music School. In 1947, in a three-way tie, he won first prize in the Prague Festival violin competition. The other two winners were Kogan and Igor Bezrodny. In 1952, he took second prize in the Wieniawski Competition – David Oistrakh took first. Again, in 1955, he came in second (to Berl Senofsky) in the Queen Elizabeth Competition. Yehudi Menuhin and David Oistrakh (both of whom were judges in the competition) later said they thought he had been robbed of the first prize. Later, David Oistrakh himself was quoted (by Joseph Magil of American Record Guide) as saying that, had he lived, Sitkovetsky would have eclipsed both him and Kogan. Magil stated that “Sitkovetsky had a broad, firm, focused tone in all registers; flawless intonation; a rapid, even trill; a swift, perfectly controlled staccato; strong, immaculate harmonics; and an even, clear sautillé." He forgot to mention the natural, intuitive sense of rubato and phrasing for which fellow musicians admired him. CDs of his recordings (live and studio) are not hard to find on the internet. YouTube has several audio files of his playing, one of which you can listen to (this one is Paganini’s Le Streghe variations based on a melody [The Witches or Magic Sisters] by Franz Sussmayer, Mozart’s pupil, but arranged by Kreisler, who harmonizes it in his own way [as usual] featuring some very clearly articulated left hand pizzicatos – Bella Davidovich on piano.) 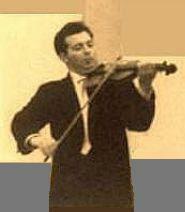 Sitkovetsky played a Vincenzo Panormo violin (also known as Vincenzo Trusiano) for a long time. That violin is now being played by Julia Igonina, Russian concert violinist and first violinist of the New Russian Quartet. Toward the end of his life, Sitkovetsky played a Stradivarius, on loan from the USSR State Collection. He died (not unexpectedly) on February 23, 1958, at age 32.